President Obama nominates Jacob "Jack" Lew to be his new Treasury Secretary. President Obama announced the nomination of his White House chief of staff, Jacob "Jack" Lew, for Treasury Secretary on Thursday. Lew, 57, had been the leading candidate for months, and if confirmed, would be the second Treasury Secretary during the Obama administration. He has overseen budget talks in times of surplus and deficits as a former budget director for Presidents Obama and Clinton. He was also a key player in the 2011 debt ceiling talks, where he earned some criticism from Republicans for his uncompromising attention to detail. Some Republicans and people working on Wall Street have also been concerned about Lew's lack of business and financial markets experience. It's not clear when the Senate will begin confirmation hearings. In 2009, the Senate took nearly a month to confirm Tim Geithner as Treasury Secretary. This nomination could be just as contentious, coming right after a bruising fight over the fiscal cliff. At a press conference on Thursday, Obama offered extensive praise for Geithner -- whom he said history would recognize as "as one of our finest secretaries of the Treasury" -- and a ringing endorsement of Lew. 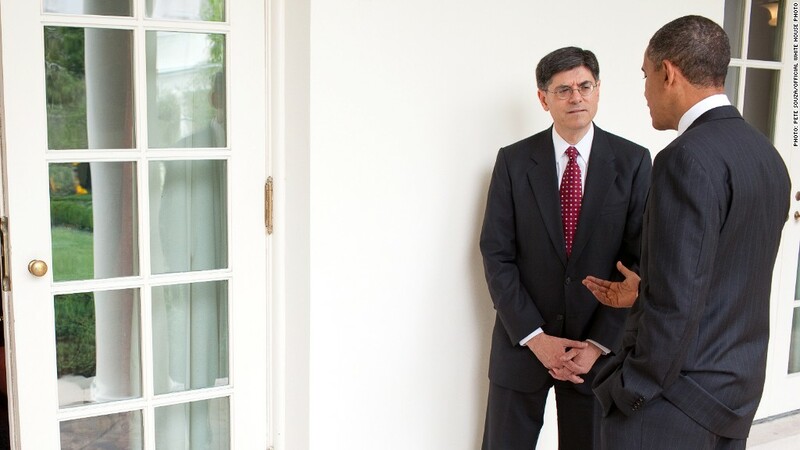 "I cannot think of a better person to continue Tim's work at Treasury than Jack Lew," Obama said. "I trust his judgment, I value his friendship, I know very few people with greater integrity." Geithner, the last holdover from President Obama's original economic team, is ready to move back to New York, where his family currently lives. The secretary of the Treasury runs U.S. domestic financial policy and is charged with collecting federal taxes and managing public debt, among other duties. Timing for the Treasury appointment is especially critical because Lew is expected to play an important role in upcoming debates. Congress must increase the government's borrowing limit by late February or early March. Without that, the federal government would be unable to pay all its obligations on time. The country hit its $16.394 trillion limit on Dec. 31, and Treasury is already moving money around to buy time. The last time a similar debate occurred, in the summer of 2011, it turned nasty: the United States lost its AAA credit rating and markets tumbled. Another issue: looming budget cuts. As part of the fiscal cliff deal, Congress pushed back severe cuts to the federal budget by two months. They had been scheduled to kick in Jan. 2 and are expected to lead to job losses and furloughs for federal employees. Lew's long career in Washington makes him perfect for the job, said Kenneth Baer, a former senior adviser to Lew at the White House budget office. Lew's experience in political horse trading goes back to the 1980s, when he was a senior adviser to legendary Democrat dealmaker House Speaker Thomas P. (Tip) O'Neill Jr.
"He's a phenomenal manager, a phenomenal colleague, a really great person who knows his material and cares deeply about public service," said Baer, who is now the managing director at the communications firm the Harbour Group. But it has not necessarily been all smooth sailing for Lew. In the summer of 2011, Lew got on the wrong side of Republicans during tense closed-door negotiations over raising the federal debt ceiling. Bob Woodward reported in his book "The Price of Politics" that, at one point, Speaker John Boehner asked the president to keep Lew from attending talks with House Republicans at the Capitol. "Jack Lew said 'No' 999,000 times out of a million," Boehner told Woodward. "At one point I told the president, keep him out of here. I don't need somebody who just knows how to say 'No.' "
Lew is expected to face tough questions from some Republicans, including Alabama Sen. Jeff Sessions. Lew has clashed with Sessions publicly over the budget and other White House policies. "Jack Lew must never be Secretary of Treasury. His testimony before the Senate Budget Committee less than two years ago was so outrageous and false that it alone disqualifies (him)," Sessions said in a statement on Wednesday. Sessions was referring to Lew's statement that Obama's budget would not add to the nation's debt. Despite a long career in Washington, Lew did log in some private-sector experience. In 2006, he went to work for Citigroup (C) as the chief operating officer of wealth management. In 2008, he was promoted to COO at Citi Alternative Investments, an area of the bank that had made bets against the housing market. "Jack has the distinction of having worked and succeeded in some of the toughest jobs in Washington and the private sector," Obama said Thursday. During his 2010 confirmation hearing, Lew sought to distance himself from being seen as a bank executive with a role in the real estate bubble and bust. He pointed out that he had been a manager and not an investment adviser. In an internal memo announcing Lew's appointment, Citi said he would be responsible for operations, technology, human resources, legal, finance and regional coordination. Despite his tenure at Citigroup, Wall Street is suspicious of Lew's lack of "significant experience in financial regulatory matters and the financial markets," said Washington analyst Brian Gardner with Keefe, Bruyette & Woods. "While he can undoubtedly learn the material on the job, we question whether he has sufficient relationships with the banking industry in the U.S. and abroad, which can be critical during a financial crisis," Gardner said in research note. Lew also worked as a financial administrator at New York University from 2001 to 2006. He received an undergraduate degree at Harvard University and a law degree from Georgetown University. Lew has developed a reputation as a details guy, who regularly logs in 16-hour days at the White House. He observes the Jewish Sabbath of leaving work before sundown on Friday and abstaining from work on Saturdays. However, he is known to have worked Saturdays in urgent situations. One detail about Lew that came to light this week is his loopy, illegible signature, which will grace the lower right-hand side of each new dollar bill if he's confirmed as Treasury Secretary. Obama joked about his nominee's penmanship at Thursday's press conference, saying Lew "assures me that he is going to work to make at least one letter legible in order not to debase our currency."